I left the scan so you can see rough cut on the bottom. 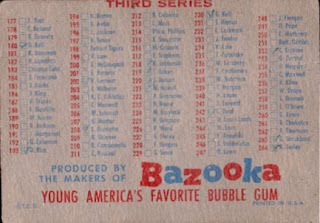 Archie, Veronica & Betty were part of an effort by Topps to make the kids from Riverdale as iconic on Blony bubble gum comics as Bazooka Joe and His Gang were on their turf. 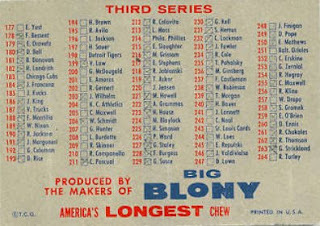 In fact, in 1957-58 Blony comics featured the Archie comics gang but it would be another decade or so before Archie became a TV star and despite Topps' best efforts, Blony Gum would not last as a brand past the early 60's (save for a later attempt to market it as a twist wrap in the 70's, also a failure). The big Beckett Football Guide also mentions a variety with white instead of yellow background and states it is equal in supply to the yellow version but my quick, unscientific search of Ebay (from whence all these scans came) and Google last night only turned up a dozen or so of the yellow type. Can anyone (I mean you Doug!) provide verification of the white version? 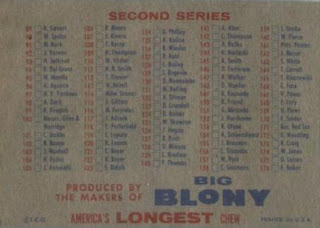 Printed on the now standard 132 card half sheets, the first series had 88 cards and the last 66, for a grand total of 154. Beckett indicates 22 double prints in the second series, which doesn't make a lot of sense to me as a 66 card print run usually means all cards are printed equally. That is a story for another day though. A brief respite from our checklist foray, blogophiles, which is fine as your webmaster is finding spare time scarce right now. So it is with an exhaled "phew!" that I present two scans forwarded by Friend o'the Archive (and soon-to-be Fleer historian) Jeff Shepherd concerning Topps Magic Photos. That is the first 6 card panel I have ever seen from this set-wow! 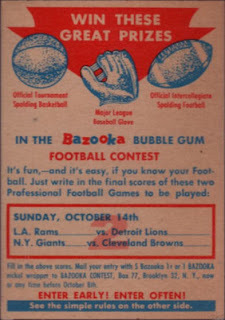 A checklist and corresponding contest card (which are about to be blogged upon in our next installment and which consist of four distinct dated guess-the-score contests) could have been printed together and inserted into the packs series-by-series. 1957 would be the last year of these bland checklists as a new paradigm was unveiled in '58. 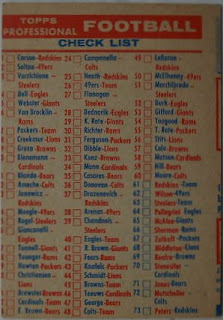 Have no fear though, we still have to take a look at what was in the football packs in '57 too! 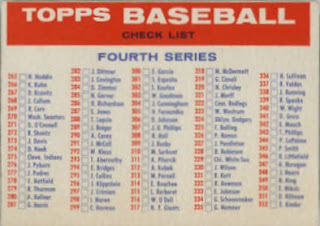 Today will be the day you read more about unnumbered 1957 Topps Baseball Checklists than you ever thought possible. 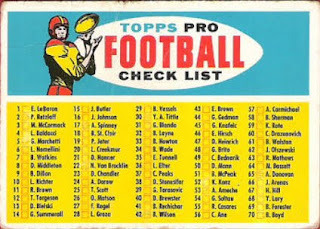 As we know, Topps issued some unnumbered checklists with their 1956 baseball and football cards. 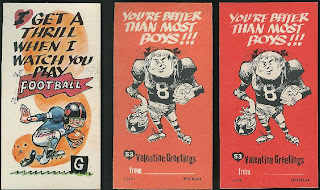 They started seeding in contest cards as well in the football packs and then in '57, amid shrinking their cards to standard size, there was a riotous frenzy of checklists, contests and premium cards added to the packs. I'll address the contest cards in my next post as this one is going to be long enough but you can see the premium card insert here. 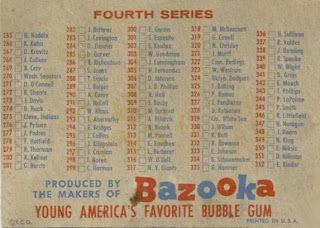 Still actively promoting Blony, the gum brand that came to Topps with the Bowman purchase in February of 1956, the '57 baseball checklists had ads for that brand and Bazooka as well. 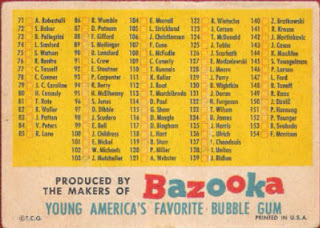 I have to think Blony was a still big seller for Topps, likely in the Philadelphia area, since they were going into warp drive promoting Bazooka otherwise. First we will look at the fronts. As you can see below, there were four checklists issued covering five series in total: 1/2, 2/3, 3/4, 4/5. Each checklist covered two consecutive series as Topps continued to work in previews of what was coming next, a meme that would grow and grow in the future. You can see the blue/red/blue/red alternating header block pattern which appears to be consistent all year long but there are also three different style fronts; only the second and fourth series obverses look close to the same and even there they swap secondary colors. 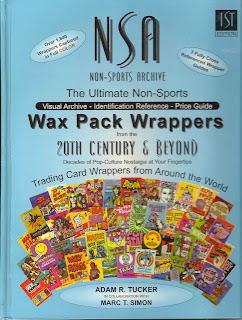 By the way, all the scans in this post are either culled from Ebay, Mike Wheat Cards or 707 Sportscards. Those first two up top have wavy or off cuts which leads me to believe the checklists were cut at high speed from vertical strips. 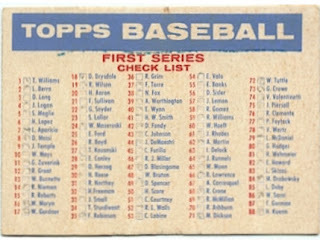 1957 uncut sheets have been seen and while they are the first to be made up of two 132 card half sheets - a sacrosanct array for Topps stretching across four decades) - none have been seen with checklists on them so once again these cards were pushed into the nickel wax and whatever cello packs were sold that year. Even the "Twin" goes to blue for the last series! The 4/5 checklists seems to be appreciably harder to finds than those from the earlier series. I can only speculate as to how they were seeded into the packs but the 4/5's could have coincided with the scarcer semi high number (4th series) cards in '57. Notice how Big Blony appears on the first two and Twin Blony on the final two. I wonder how the rough and tumble boys of 1957 liked the "made of...sugar 'n' spice 'n' ...everything nice" line?! 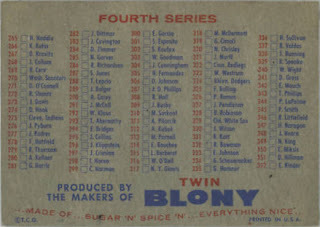 In case you are into symbolic gestures, note how the 1957 set matches the 1952 with 407 subjects, and includes team cards once again but also two multi-player cards of the Yankees and Dodgers (almost a first if you discount the 1954 O'Brien twins card) plus a combo of the league presidents, a sure fire bicycle spoke candidate. 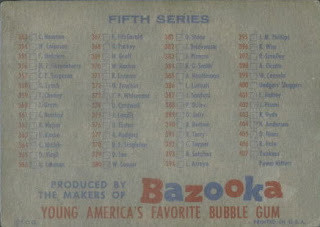 The first four series in '57 have 88 cards, which means each would have been printed three times over two 132 card sheets and a final series of 55, a number which seems to lead to short prints in the Topps universe (along with 77). 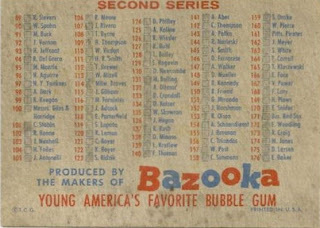 I'll post a 1957 Topps Baseball set overview someday that delves into this more deeply. 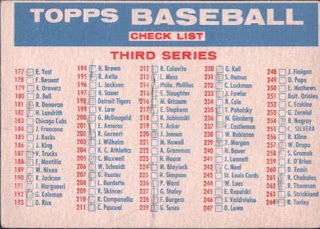 For some reason the 1956 checklists seem to be in greater supply than the 57's. I find this odd as the normal Topps trendline is increasing production for each successive year but maybe more 56's were simply printed. The price guides seem to price the 3/4 checklist at about double the level of the previous two but supply of all three seems pretty similar. As noted above, the 4/5 checklist is the toughest by far. 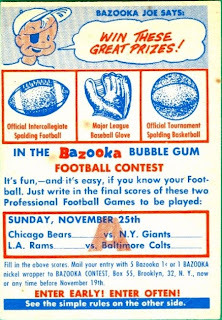 Hang tight-a look at the 1957 contest cards will be coming up right quick! Meanwhile, we'll see if any of our eagle-eyed readers can find some further checklist variations. OK, I'm a month early but seeing all the Valentine's Day candy has inspired me to show all you folks out there in TV land a tough to identify variation. The middle picture shows a lighter red back than the rightmost example and as it turns out it was of a 1961 vintage, while the redder version is a 1966 reissue. 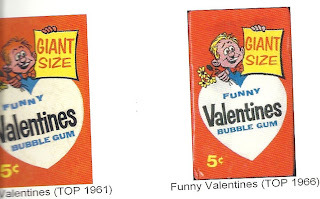 shows two similar, yet distinct packs were used to market the set five years apart. The only real difference is the kid on the 1961 pack has red hair and the '66 shows a blond. The '61 pack is near the spine of the book, sorry for that. There is some other evidence of the 1966 reissue as well here, just scroll down a little and you will see a production code for it. So a set long thought to be from 1961 is also from the future as well! 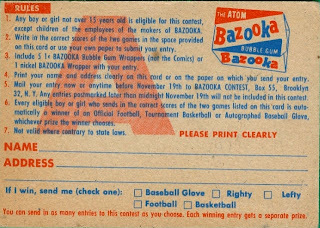 Hot on the heels of my last post, I received a scan of a contest card reverse from friend o' the Archive Mike Tavenner. You will see the "A" identifier also is on the back of the card. Next on the hit parade, are there similar variations for each type and date? I doubt if you could identify them now but I wonder if any of the contest prizes have survived the last 54 years? I had to grab that from Ebay as I have not yet waded into the 50's inserts personally. 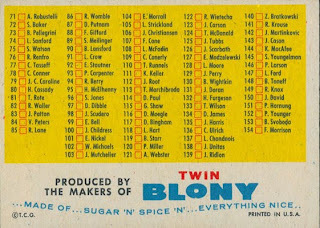 Unlike the baseball checklists from '56, Blony Gum does not seem to have made the cut for football, although Topps would continue to market the historic brand aggressively for a few more years. 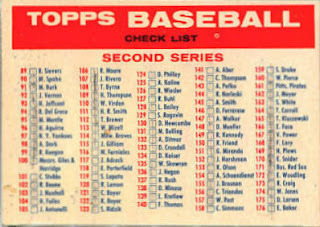 120 cards is an interesting figure as well as the cards would have been printed on 110 card half sheets (two of which comprise 220 card full sheets; half sheets are what almost all extant uncut sheets actually are) as seen in the '56 baseball checklists post. 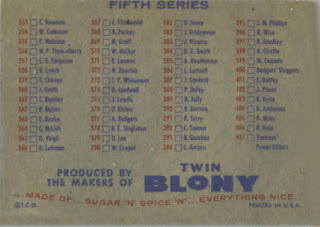 This gives 11 rows and 10 columns, or vice-versa depending upon your perspective, on a half sheet and it appears there are 20 short prints in the '56 football set, so we have a number divisible by 10. I've never seen a full '56 FB sheet but if you take each 110 card half sheet and print 100 cards in the same quantity on each and then a different group of ten each in one column on each half sheet you can get to 120 different cards with 20 short prints very easily. 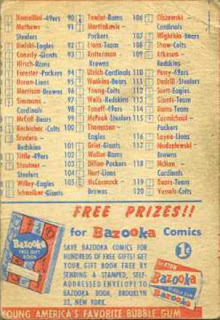 This will be a discussion for another day as there is also some thought certain teams were short printed in their entirety and wouldn't you know it, there were twelve teams that year and at ten cards each you get 120! C1, C2, or C3 for the three types of October 14th games (C must be for "Contest") and CA and CB for the November 25th games. There is a question as to the existence of the third type of November 25th card and since I can't find any good back scans of these at all, I'll leave that for another post as well. You can see the number or letter superimposed int he center of each card. 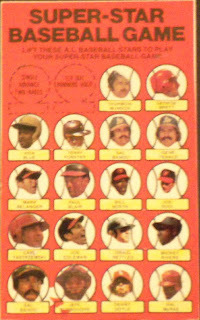 The contest cards and checklist are tough and the checklist is difficult in nice, unchecked condition, much more so than one of the baseball versions. Miscut and off-centered checklists are frequently seen. My feeling is that the contest cards were a way for Topps to see if their distribution network was working efficiently. 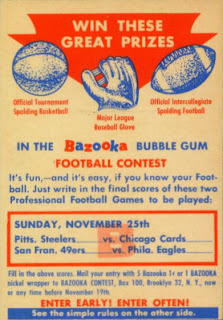 After all, they now had tons of addresses from around the country and could see where their cards had been sold and it appears Topps tried to get a team from both coasts and middle of the country on each card, which would make a lot of sense for a nationally distributed product. 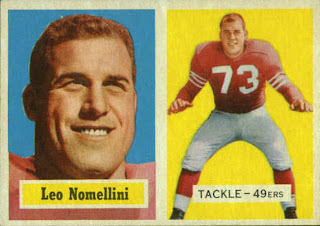 1956 was also the first year of the NFL's national TV contract, so the stars were aligned for Topps! Continuing on with last year's final post, presented are two more Topps prototypes provided by Scott Gaynor. 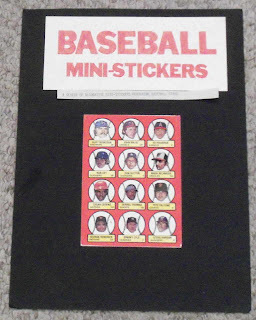 These were probably produced around 1976, as evidenced by the player selection and team affiliations and I have to think they were developed together as the similarities are many. I remember this set from 1991 and recall the candy being pretty tasty! These come in both clear and colored containers. 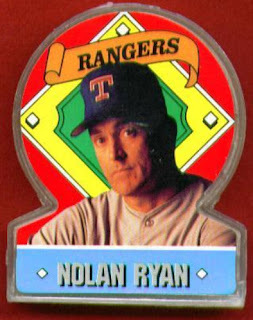 At least one type was a test but I am not certain which and have not extended my research into the 1990's in any event, although there was a lot of innovation at the time by Topps.